The “Apple products are cool” saga only reached a conclusion last week when the fruit company made its apology, and today, Apple’s UK website has now clarified the original issue, along with ads in several UK newspapers. If you happened to miss the story, perhaps a little background information is in order. A short while back, Apple tried, and indeed failed, to remove Samsung Galaxy Tabs from sale in the United Kingdom. The Cupertino company’s beef was, as you might have guessed, based on trademark infringement, although since the claims were adjudged to be unfounded, Apple was forced to apologize by means of a statement. Terms of the judgment demanded Apple not only make a statement on its UK website, but also in a bunch of printed news publications, and today, the day has come for that ruling to be put into action. With so many patent infringement battles going on worldwide between two of mobile’s foremost companies, it can be a rather bamboozling prose to follow. Although Apple certainly shouldn’t have made ultimately defamatory statements about its South Korean rival, it’s not as though separate court rulings – such as the one recently concluded in San Jose, US – haven’t seen Apple proved right in its claims of copyright and trademark infringement. 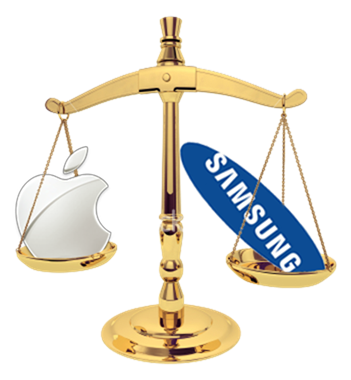 As a result of the San Jose hearing, the LCD specialist has been ordered to pay Apple in excess of a billion dollars in damages – something Samsung is naturally appealing. With both companies rather keen to prevail in these battles small and large, no long-term solution appears to be in sight. It is widely though Samsung, of the two, is keener to find some sort of amicable outcome, but while Apple continues to be on the warpath, no end appears to be in sight. Tim Cook is a lot more placid in nature when compared with his predecessor, and is said not to favor the lawsuit approach. Having said that, he has met with Samsung’s head honchos on numerous occasions in an attempt to talk things through, but to no avail, so until both companies can make a workable arrangement, expect to see more pot-shots, outlandish statements, and courthouse coverage.